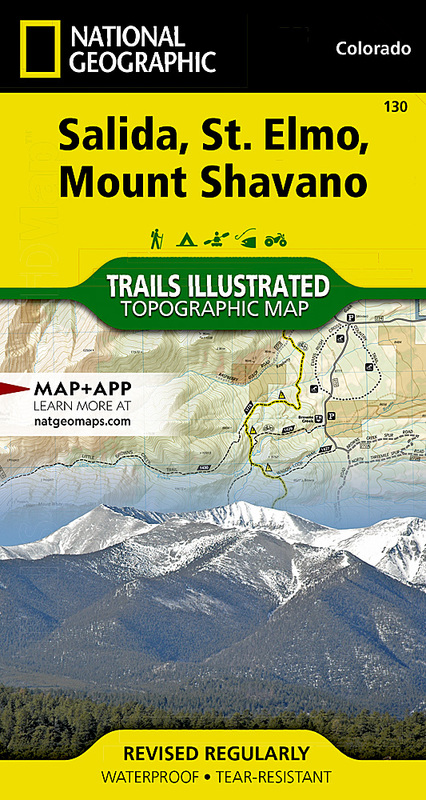 National Geographic's Trail Illustrated map of Salida, St. Elmo and Mount Shavano offers unparalleled detail for outdoor enthusiasts exploring this area in the heart of the San Isabel National Forest. Expertly researched and created in partnership with the U.S. Forest Service, the Bureau of Land Management and others, this map will guide you along the trails, up and down the peaks and across the rivers and lakes as you enjoy your adventure or recreation activity. The map features many points of interest, including North Fork Resevoir, Tabeguache Peak, Mount Princeton and the Collegiate Peaks Byway along with its many recreation areas. The map's clearly marked trails and trailheads can guide you off the beaten path and back again. Parts of the Continental Divide Trail and Colorado Trail that pass through the area are highlighted on the map as well as mountain bike routes. The map base includes contour lines and elevations for summits, passes, lakes and rivers. Some of the many recreation features noted include ski and snowmobile areas, shooting ranges, river access points and fishing areas, campgrounds and ranger stations. Other features found on this map include: Gunnison National Forest, Mount Antero, Mount Princeton, Mount Shavano, San Isabel National Forest, Tabeguache Peak.